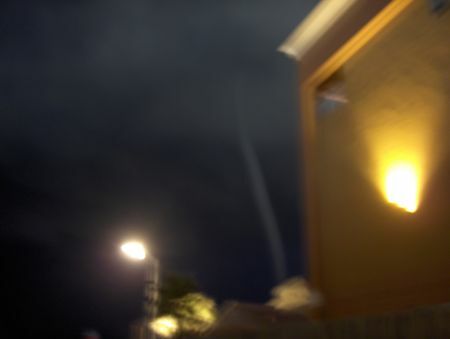 Here is the photo I took of the waterspout in the Gulf of Mexico right before it came onto land and injured a few people and destroyed property. The photo was taken at 8/30/09 9:41pm at 17th street at Seawall in Galveston at an establishment called Captain Jack’s. The waterspout hit land and briefly became a tornado about a dozen blocks away from where I was and about 30 blocks away from the hotel I was staying at. Some of my family members were at a hotel very much closer to where it hit land. The light was low, so the first picture I took using the flash didn’t come out. This one is motion blurred because I took a long exposure and didn’t have a tripod handy.